We carry a wide variety of products here at M & S Accessories and work with all makes and models of Cars, Trucks, and SUV’s. Go to Contact Us Page and fill out a request for a quote. 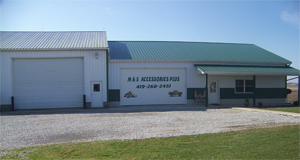 Also we carry and and can get Snowmobile & ATV Parts, Accessories, and Apparel.